Heck, at those rates, I know several “ethically diverse” bloggers that may be willing to help out. Both parties came together to approve HR4587, the Venezuela Human Rights and Democracy Protection Act. Read all about it at Da Tech Guy Bog, and please hit Pete’s tip jar. Colombia: Zuluaga change of heart? In an apparent change of heart, Colombian presidential runner-up Oscar Iván Zuluaga declared that he would not suspend the peace negotiations with the FARC taking place in Havana. did not say how long he would give the FARC to declare a ceasefire, a condition it has rejected until now, but said he softened his stance at the request of Conservative Party leader Marta Lucia Ramirez in exchange for her support in the run-off vote campaign. Call me a cynic, but this looks to me like a statement purely for local consumption, designed to diffuse Santos’s false choice of it’s-Santos-or-war, redacted after internal polls may have shown that it would favor his election on the June 15th runoff. Leaders of Mexico’s main leftist party trekked to Washington this week with a warning for U.S. power brokers—investors could lose their shirts if they put their money in the country’s energy industry. Jesus Zambrano, leader of the Party of the Democratic Revolution, or PRD, the main party of Mexico’s splintered left, and other leftist politicians are in the middle of an unprecedented pilgrimage to Washington. They are meeting with U.S. officials, legislators and businessman to explain that a referendum being pushed by the PRD could undo a historic constitutional change passed late last year that opens the country’s oil and gas industries to private companies and foreign investors for the first time in 75 years. Their message: Mexico’s energy reform is not a done deal. Until the fine print is dry, the country’s oil and gas fields are no place to bet a bundle. Zambrano, a former communist guerrilla who has referred to D.C. as an enemy, didn’t get the turnout he expected last year when protesting the energy reforms. Since it’s unlikely that the PRD would gather at least 1.6 million signatures, and get the Mexican Supreme Court to approve a referendum, they tried the next best thing: a junket to Washington, D.C.
Move Ratchets Up Pressure on President Nicolás Maduro’s Beleaguered Government. The U.S. House of Representatives overwhelmingly passed a bill Wednesday to penalize Venezuelan government officials found to violate human rights in that country’s crackdown on a protest movement, ratcheting up pressure on President Nicolás Maduro’s beleaguered government. The bill calls for President Barack Obama to draw up a list of Venezuelan officials who are alleged to have violated human rights, freeze any assets they might have in the U.S., and bar them from entering the country by either withdrawing or denying visas. A similar bill has been approved by a Senate committee, and is headed for a vote on the Senate floor in coming days. Passage of the bill also raises pressure on the Obama administration, which has been wary of passing any kind of sanctions for fear it could create a backlash by allowing Mr. Maduro to mobilize supporters against the U.S. and distract from Venezuela’s growing homemade troubles. The administration also fears that the sanctions could jeopardize attempts at reaching a negotiated solution between the government and the opposition. What negotiated solution? The o-called “negotiations” fell apart already. Democrats led by Michigan Rep. John Conyers wrote a letter to President Barack Obama on Tuesday backing his administration. They also urged an exchange of ambassadors with Venezuela after a four-year hiatus. Does this sound like a government willing to exchange ambassadors? Venezuela alleged on Wednesday that the U.S. ambassador to Colombia has plotted to destabilize President Nicolas Maduro’s rule, adding to tensions between the two countries as the U.S. House approved a measure calling for sanctions on officials in the South American nation over human rights abuses. A couple of days earlier, Mind your own business, Venezuela foreign minister tells Kerry. In Caracas, Venezuelan President Nicolas Maduro welcomed the Democratic lawmakers’ initiative, saying he hopes “there is a bit of wisdom” in Washington. This wisdom from the guy who talks to a bird he thinks is Hugo CHavez. Never mind, the Russian Foreign Minister says all problems should be solved on the constitutional basis, without threats of sanctions. In theory, they should; in reality . 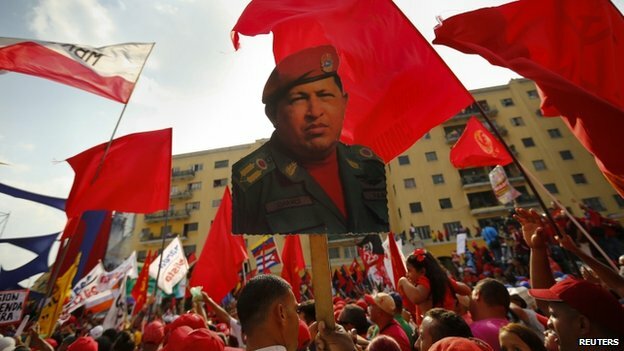 . .
For the sake of U.S. national security interests, the United States needs to act swiftly and resolutely to hold the Chavez-Maduro apparatus accountable. The bill is now headed for a vote on the Senate floor. Silvio Canto and I talked on this and other subjects in last night’s podcast. For many Brazilians, the Cup has become a symbol of the unfulfilled promise of an economic boom for this South American nation. But the boom has fizzled. And now the World Cup’s $11.5 billion price tag—the most expensive ever—and a list of unfinished construction projects have become reminders of the shortcomings that many believe keep Brazil poor: overwhelming bureaucracy, corruption and shortsighted policy-making that prioritizes grand projects over needs like education and health care. Brazil’s World Cup Build-Out Is Late and Over Budget; Workers Scramble to Finish Roofs, Seats and Sidewalks. Don’t miss the slide show. Glum: Brazil’s economy grew by 1.8%, and its bonds were downgraded to BBB-, the lowest investment grade.